Note : For 21 years old and above. After curating music for over 12 million music enthusiasts in the past 3 years, India’s largest electronic music tastemaker brand - Music High Court (MHC) presents a whole new live music experience under 'Throwdown'. 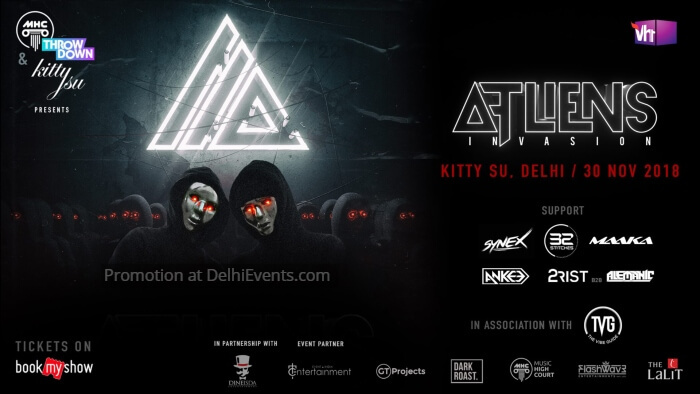 The famous masked menace DJ/producer duo, ATLiens, have unleashed a steady stream of dark, trance-inducing, bass-driven music, helping them emerge as one of the hottest names in the scene and putting them among the top worldwide. Arguably one of the best-branded duos, they bring a desired dark energy matched with consistently evolving sound design, which keeps them fresh and easily one of the most exciting rising artists. Their productions include collaborations and support from Diplo, Bassnectar, SLANDER, Boombox Cartel, Skrillex, A-Trak, DJ SNAKE, ZEDS DEAD, RL Grime, Baauer, NGHTMRE etc.